Have I got a treat for you guys! A while back, the folks at Under Armour contacted me to try out one of the newest products. I looked through a list of products they offered, including the cutest pink running shoes I’ve ever seen. Unfortunately, I read reviews on them, and a lot of people said they run narrow. Nothing on my body is narrow so I decided to go with an article of clothing. 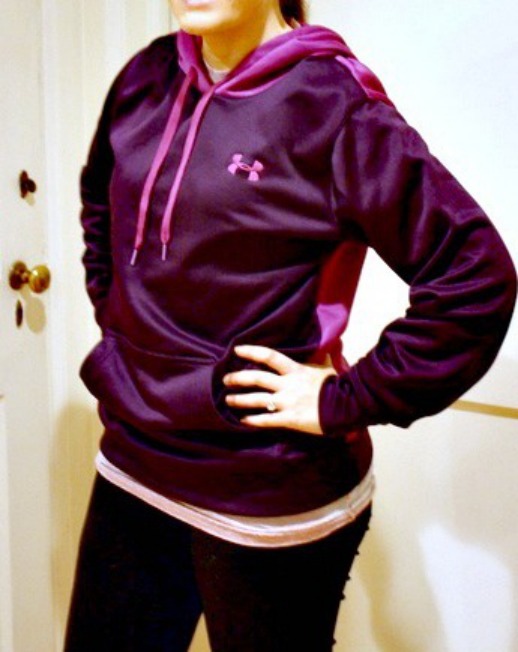 And here is what I chose — the Under Armour Fleece Divide Hoody. I took my review of this product very seriously and decided to wear it on 23 different occasions before reviewing it here. No seriously, I really love this hoody. I was actually surprised when I received it in the mail. The website only showed bright yellow and orange, so I was thrilled to get to try out this dark purple color. It’s definitely more “me”. I was also a little surprised by the material. As you can see in the photo, the material has a sheen to it, which I couldn’t tell in the photo on the Under Armour website. When I read “fleece”, I assumed it was fleece both inside and out. However, I really love the material. It’s nice and thick and the inside is lined with fleece, while the outside is a bit more water resistant. I should know. Rascal and I have been on many a walk while I wore this fleece. Which brings me to the hood. I love jackets with hoods, but I don’t own many sweatshirts or fleeces with a hood. I am notorious for forgetting an umbrella and I don’t mind a nice walk in a gental rain, as long as my head is covered. This fleece has been perfect for that. 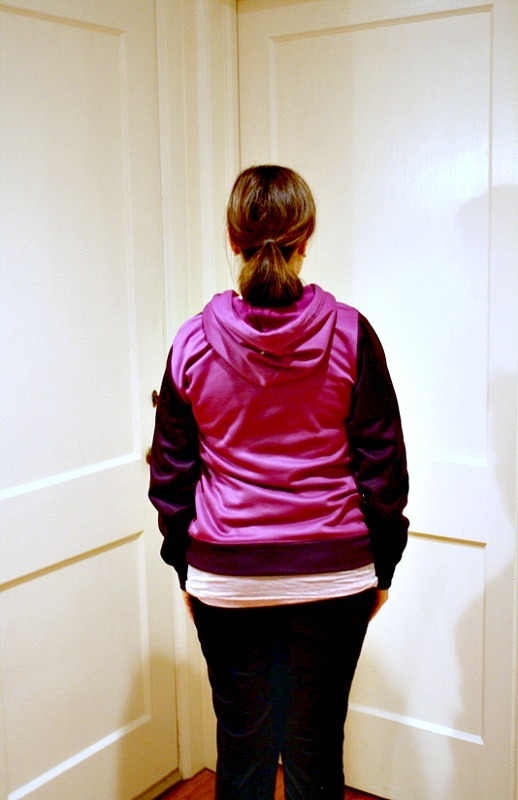 The back of the hoody is another shade of purple — a more pinkish purple that compliments the dark purple very well. As you can see, the hoody is very roomy. I typically wear a small and I have plenty of room in this. In fact, I have to say that it runs a bit larger than the average “small”. 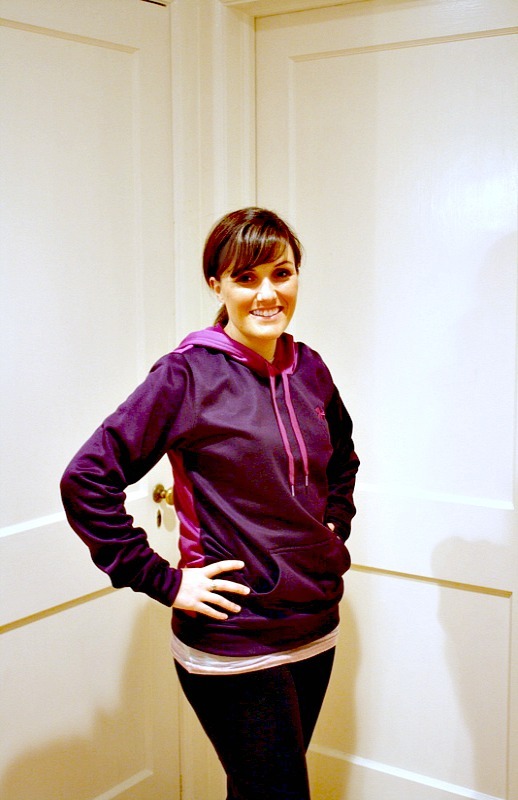 However, I like hoodies to be roomy, which makes for easy layering. When I forget my gloves, I can pull the sleeves over my hands, which may be annoying for some, but helpful for forgetful me. But my favorite part of this hoody is the pocket in the front. Another great place for my hands when I forget my gloves! Plus, it’s awesome for keeping my phone when I’m listening to podcasts or music on long damp walks with Rascal. This hoody is one of those things I will wear until it becomes holey and starts to fall apart. But it’s very well made so I can’t imagine it becoming worn-looking any time soon. It’s warm, soft, and cozy on the inside and I’ve wore it more times than I care to admit (probably more than 23 times) since it was sent to me about a month ago. Come back tomorrow if you would like to win one for yourself! I have the their sweatpants similar to that hoodie and I agree, they are fantastic. I love how much better it blocks wind than others. Love the two different shades of purple! Frankly, I would give this cute hoodie to my 11.5 year old daughter, Natalie, who a) loves all things purple, b) just got braces on today (yikes – but yes, they are purple too!) and c) would wear it everywhere! She has beautiful auburn hair and sparkly blue eyes, so I think it will look fabulous on her!